Whilst photographs are something we can all relate to on a personal level, have you ever wondered how the camera ever came to existence? Throughout time we’ve watched the photographic process grow into what it is today. We’ve witnessed vast technological advances and innovation that even our smart phones are capable (if not better in opinion to some) than your common DSLR camera. This infographic is a journey through time to get us to this conclusion. The ‘Camera Obscura’ was developed by Hasan Ibn al-Haytham, a Physicist , during the 11th Century. An exposure through the camera obscura took 8 hours to capture and did not leave a permanent photograph. The earliest known surviving photography was taken by Joseph Nicephore Niepce somewhere between 1826 or 1827, however the first known coloured image to remain permanent was taken by James Clerk Maxwell in 1861. Made by Louis Daguerre, the Dagguerrotype was the first, commercially successful photographic process invented somewhere between the years of 1839 to 1860. It’s a unique process that produces an image on a silvered copper place and was mainly used by people who could afford to have their portraits taken back then. Despite the many processes Daguerre used to develop imagery on highly polished silver-plated copper, each dagguerrotype piece was remarkably detailed. In 1840 British scientist Henry Fox Talbot invented the ‘calotype’ (also known as the ‘talbotype’) to solve the issue of finite printing (adopted by the Dagguerrotype) and allows negatives to produce as many positive prints through a process known as contact printing. The developing process permitted much shorter exposure times in comparison to the Dagguerrotype – from one hour down to one minute, making it superior in this respect. 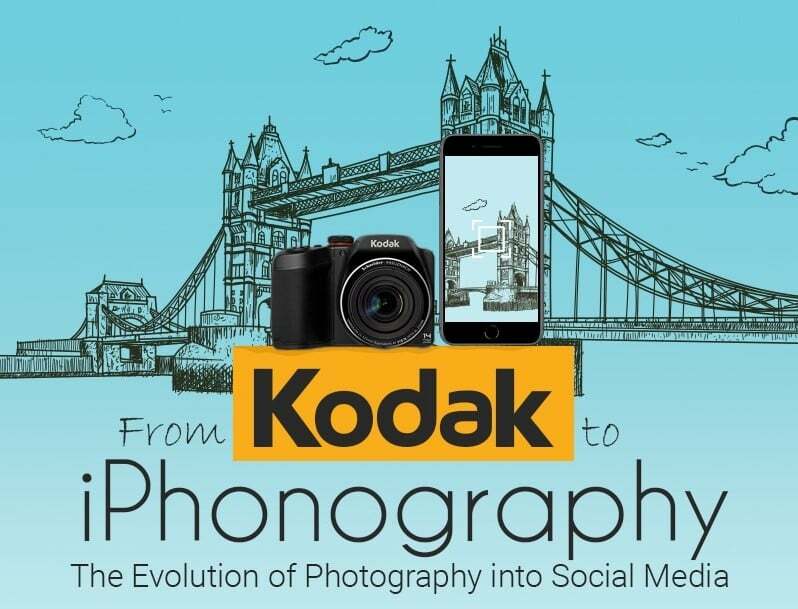 Kodak was a pioneering brand for photography and was known for introducing film to replace the use of paper in 1889. Using the razor and blades strategy they sold box cameras for as little as a $1 and made large margins as a result of their consumables. They became extremely successful due to their fast rate of technological developing and high rate of globalisation. American Electrical Engineer Steve Sasson whilst working for Kodak invented the first digital camera. It weighed 8 lb (considering the average weight today is 1.27lb -3lb, that’s a very heavy camera!) and recorded 0.01 megapixel black and white photos to a cassette tape. An exposure using this digital camera took roughly 23 seconds and playback was possible through a tape recorder displayed on to a television set. Since then, cameras have now been capable of achieving 360-degree wraparound imagery and 4k resolution amongst many other technological advances; however the demand for on the go photography has increased immensely, with 4 billion out of 5 people owning a Smartphone with a built in camera – globally. Mobile photography has exploded beyond the dreams of the photography industry. According InfoTrends analyst David Hauter “Smart Phonse have become the primary camera for most consumers, and there’s no sign of that changing as the photography capabilities of these devices evolve and get better with each new generation”. With the demand for higher tech smartphones and innovative built-in cameras, research has shown that the global camera market will continue to drop as smartphone sales increase. This was due to a 17% drop in DSLR production and a 35% decrease in shipment world-wide. An estimated 657 billion photos are clicked per year by smartphone users – with 90% of smartphone users having only ever taken a photo with their built-in camera. By device– smartphones dominated usage by 85%, with the remainder being split between tablets and digital cameras. Posting pictures online is essentially a form of status display – whether you’re a professional photographer, business or simply just want to share family imagery. One of the most interesting things about photography and its progression through social media is how it effortlessly displays our aesthetic, but of course, this does not come without a price. Photography is now in a place where the person who owns a £10,000 photography kit is not guaranteed to take the most amazing photograph. On-the-go image editing software has become so advanced that it makes those with even the most basic of photography skills edit their images effortlessly and share them fast. Instagram is by far leading the way, especially with its clean interface and flexibility to cater for a wide range of aesthetics. It’s also interesting to note how some filters and editing techniques resonate better than others – such as lowly saturated images that gain 18% more likes that their more vibrant counterparts. Image sharing on other social networks such as Twitter, Facebook and Pinterest are also pioneering the way for social interaction. Image sharing is such a popular way to connect that almost 136,000 images are uploaded on Facebook every 60 seconds alone! Whether this be for positive social affirmation or otherwise, photography shared through social media communicates far more than the average status update. Antonio Leanza owns the London School of Photography in England, UK. He is a photographic artist, coach and teacher with much experience in past lecturing roles at LCC for over ten years and for Ilford Film across the UK. He has a unique approach to teaching and mainly focuses on a students’ creative journey and helping them realise their aspirations in the photographic world.